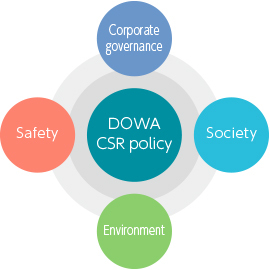 DOWA group is proceeding on basis of the CSR plan targeting year 2020. Occupational health and safety is one of the most important themes in helping the DOWA group to promote CSR activities through business and with that thought we are developing various safety activities based on our basic philosophy, “Safety is the top priority”. The DOWA Group recognizes the impact of business activities on the environment, positions environmental and social initiatives through its core business, and works for the reduction of the environmental impact on its business as an important issue in management and is working on a group wide initiative. The DOWA Group aims to be a company trusted by all stakeholders for sustainable development and is taking initiatives to enhance the relationship with the society through its CSR activities. Copyright（C）DOWA HOLDINGS Co., Ltd. All Rights Reserved.